Rev. 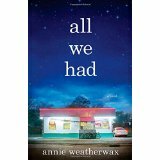 Marjorie’s book of the month, All We Had, authored by Annie Weatherwax, is in part a commentary on the sub-prime crisis past as well as its larger, scarier questions about the path to adulthood after a childhood spent simply trying to survive.” Both Rev. Marjorie and, the author, Annie Weatherwax will join the discussion. The Group will meet in the Commons tonight, December 2, from 7:00 to 9:00 pm. We think you will enjoy this so please come if you can!